Gather and Rally at 8:30 a.m. | March begins at 10 a.m. The Moral March on Raleigh is part of a love and justice movement. We fight for an intersectional agenda to support public education, economic sustainability, workers’ rights and livable wages, health care For all, medicaid expansion, environmental justice, equal protection under the law without regard to race, immigration status, gender, gender identity or sexual orientation, voting rights for all, and criminal justice. On February 11, 2017, we will gather at 8:30 a.m. in downtown Raleigh. The opening rally will begin at 9:00 a.m. and the march will begin at 10:00 a.m. after which we will begin the mass People’s Assembly on the doorstep of the State Capitol. 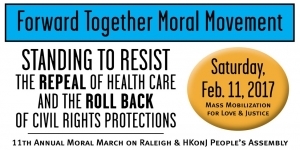 This year, the Moral March on Raleigh will focus on our moral duty to stand against the repeal of the life-saving Affordable Care Act, the legislative tyranny of our extremist-led General Assembly, the racist and unconstitutional gerrymandering which undermines the vote of all North Carolinians, the anti-family, anti-worker, and anti-LGBTQ hate bill 2, and the extremism and lies of Trumpism, which undermine our Democracy at the federal, state and local level. Donald Trump and his administration have undermined our Democracy and democratic institutions by making regressive federal appointments and inviting white nationalists into the White House. They have demonized our immigrant and Muslim brothers and sisters by building a wall on our Mexican border, pushing through an Executive Order which effectively bans many refugees and Muslims from our country, and blaming Latinos for voter fraud that does not exist. For the past eleven years, a fusion movement has been growing in North Carolina. In 2006, the Historic Thousands on Jones St. (HKonJ) People’s Assembly Coalition was formed under the leadership of Rev. Dr. William J. Barber, II and the North Carolina NAACP. It has grown to include over 200 coalition partners. Each year this fusion movement comes together on the second Saturday in February to hold a mass people’s assembly to reaffirm its commitment to the 14 Point People’s Agenda and to hold lawmakers accountable to the people of North Carolina. This year’s annual people’s assembly will be held in the wake of the election of Donald Trump and the political coup by our extremist legislators to limit the power of Governor Roy Cooper. We will continue our fight to challenge and expose the immoral and unconstitutional policies supported and passed by former-Governor Pat McCrory, Speaker Tim Moore, Senate Leader Phil Berger and other extremists in the NC General Assembly. If you believe that an injustice anywhere is a threat to justice everywhere, if you understand that what happens in North Carolina has implications for the future of the nation, if you believe that we can build a moral movement together to save the soul of our state and country, then join us as we tell the North Carolina General Assembly, “Forward Together, Not One Step Back!”We are calling on all people of conscience and concern to join us as we stand against the extreme and regressive agenda being pushed in North Carolina. This agenda is a reflection of what is happening across the United States.